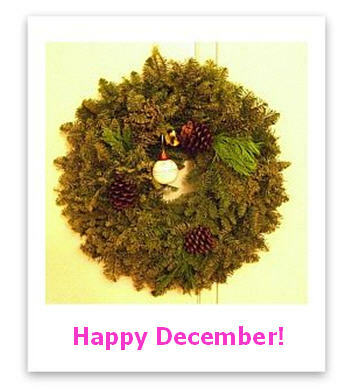 I love this time of the year, but I’m having a bit of trouble getting into the spirit of the holidays for some reason. Christmas is only a few weeks away and I haven’t even begun writing cards, baking cookies, or started shopping – things I usually enjoy around this time of the year. With the exception of the Christmas wreath on the wall and a basket full of Cuties (those little delicious mandarin oranges) sitting on the coffee table, nothing in the house sings the song of the holidays! But I’m surprisingly okay with it. In fact, I’m kind of digging this low-key, stress-free December days. One thing I’d love to do before the year ends is knit my first pair of socks! I think about hand knit socks a lot lately, and how much fun the whole process would be, if I only have the courage to begin (especially since I love knitting in the rounds with double-pointed needles). I’ve been studying patterns in sock-knitting books like how high school students study for the SAT, trying to decipher what the heck gussets are … and my mind still can’t grasp how it all works! I must admit that I usually spend December running around getting ready for Christmas, and forgetting the real beauty of the holiday season. So this year, I made a commitment to enjoy every second of December by indulging in the true spirit of the holidays – from the woodsy smell of a pine reef that hangs on the wall, to the sweet scent of homemade cookies that fills my tiny but warm apartment. And most importantly, cherish the time spent with friends and family. 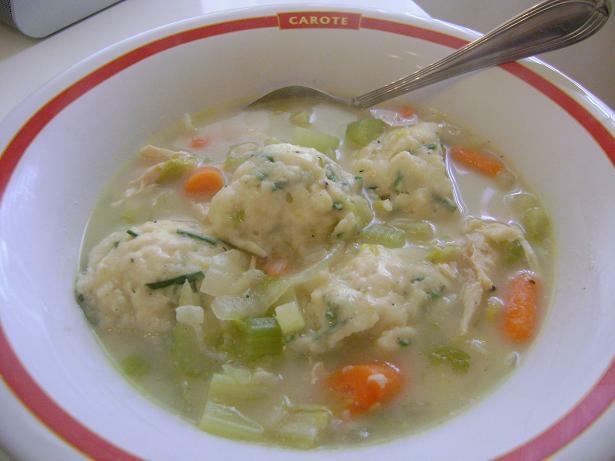 There is nothing better than starting the month by enjoying a warm and hearty bowl of soup. 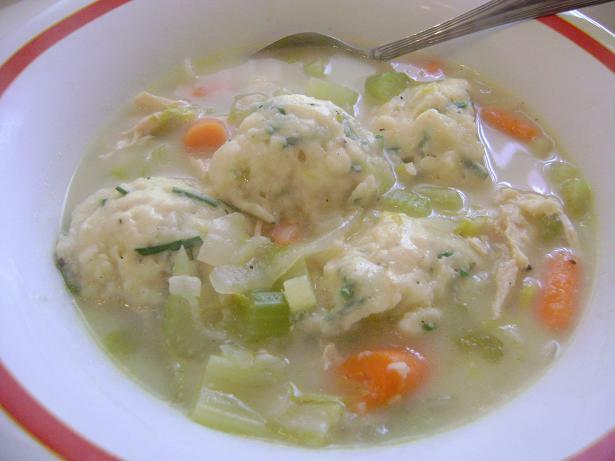 This is the Chicken and Dumplings that I made for my boyfriend when he was recovering from being under the weather the other day. When he told me that he wanted something light and easy for his tummy for dinner, the first thing I thought of was Chicken and Dumplings. The problem was that I had never cooked one before, so I searched through several recipes and came up with my own. This recipe was inspired by Tyler Florence but I modified it significantly to fit whatever ingredients I had in the fridge. The end result may not be as intricate as his, but it still provides a warm and delicious soup that I’m sure you’ll enjoy during the cold winter month! 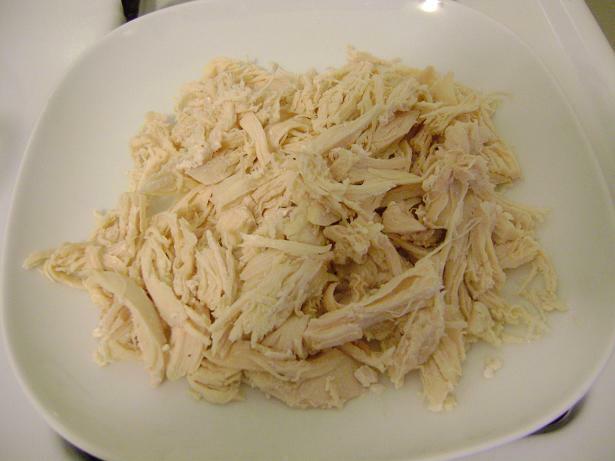 Boil the chicken in large pot in 3 cups water (or more, if needed) in medium heat, with salt and peppercorn, until chicken is fully cooked, about 30 minutes. Take the chicken out, let it cook, and shred the meat with two forks. 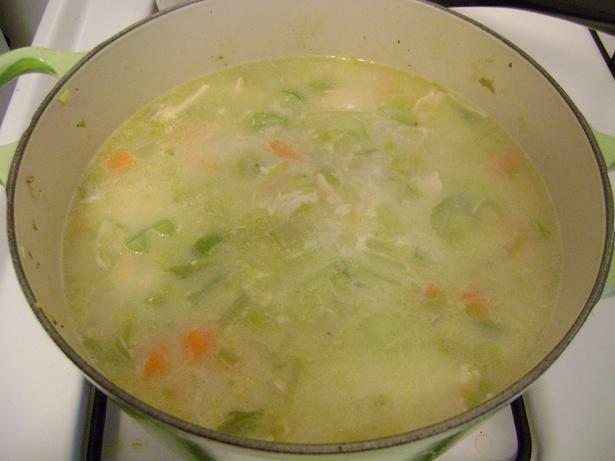 In the meantime, simmer 3 cups of store-bought chicken stock in a medium-size pot. Note: I use 3 cups of store-bought stock and 3 cups of stock made when boiling the chicken. You can do all 6 cups of store-bough kind, or 6 cups of homemade ones, your choice. I find that 1:1 is the perfect combination and there is always at least 3 cups of leftover stock sitting in my fridge. 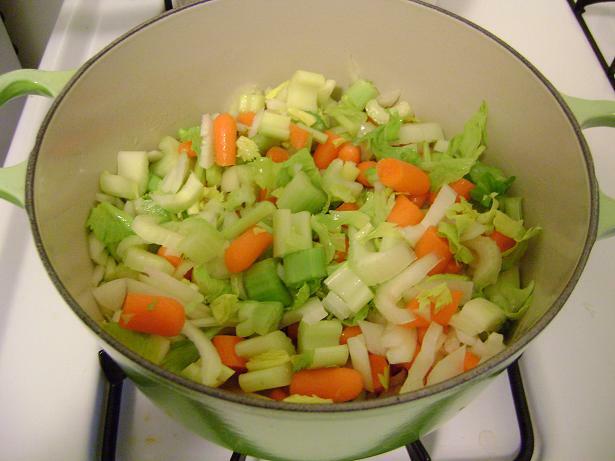 Sauté garlic, celery, onion, and carrots in a large Dutch oven with olive oil until translucent. 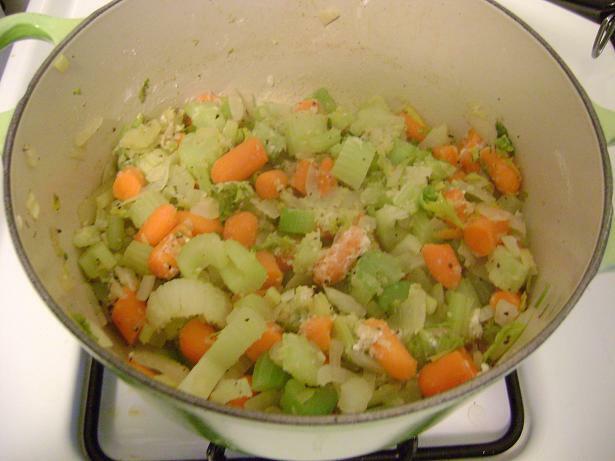 Since the vegetables will cook more in stock, you don’t have to sauté them for too long, but I love mine soft and mushy. Add 1/4 cups of flours to the vegetable mixture and cook for about 3 minutes (add more olive oil, if needed). In one bowl, sift together the flour, salt, and baking powder, and set aside (dry ingredient). In a separate boil, bet the egg, milk, pepper, and baking powder, until well combined (wet ingredient). Add the dry ingredients into the wet ingredients and mix until well combined (be careful not to over mix!). 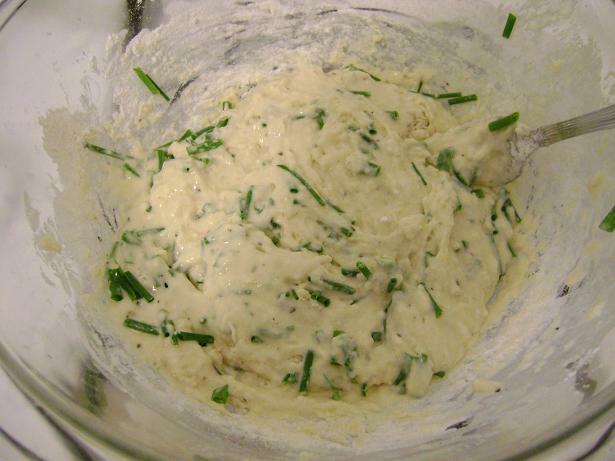 Mix in the chives. 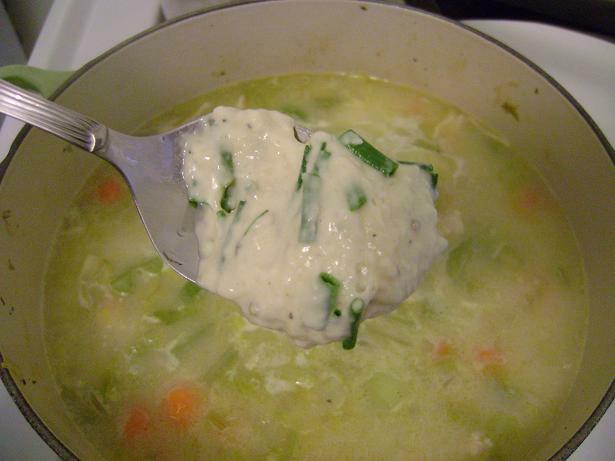 Scoop the dough with a spoon and drop it in the simmering soup. I personally like smaller dumplings instead of giant ones, because they are cute and easy to eat. 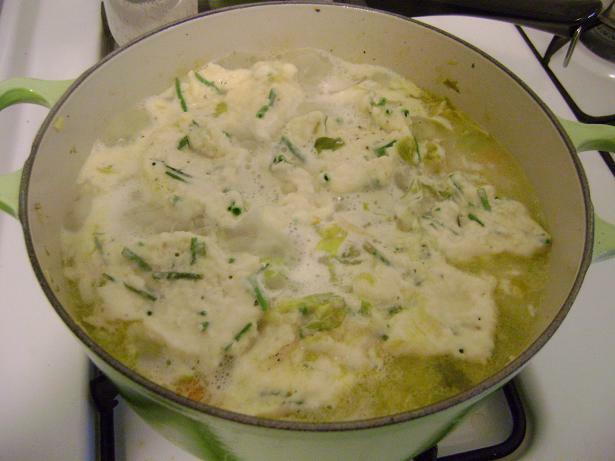 Let the dumplings simmer for about 5 minutes, until they are fully cooked. Because the dumplings have baking powder, they come out light, airy, and totally delicious!